Doris, my wife of more than 51 years, loves researching old East Texas communities as much as I, but driving down muddy county roads frightens her as much as a growling bear. On a trip to Rusk recently, we ran across a friend, realtor Ike Frazier, who told us about a cluster of buildings that once constituted an agricultural community in Nacogdoches County. But he didn’t know the name of the settlement. Following his directions, we struck out in Doris’ PT Cruiser trying to find the place. The first leg of the trip was down a couple of paved state highways, but then Ike’s directions said we should turn on a dirt road. At this point, Doris had some serious misgivings, especially when we had to cross an old wooden bridge spanning the Angelina River. But she continued like a good soldier and, finally, the red dirt road turned into an oiltop surface and Doris heaved a sigh of relief. Only a few buildings and homes remain at the old settlement of Dextra. We turned a bend and, just as Ike explained, a cluster of buildings and homes stood on a hilltop. We found that the community was once called Dextra, which was settled before 1900. 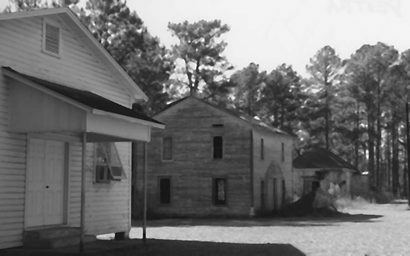 In the mid-1930s, the community had a school, a church and several stores. After World War II, many of Dextra’s residents moved away, but as late as the mid-1960s, the community had a store and two churches. In the early 1990s, Dextra was little more than a dispersed community. An inscription on a plaque at old Hopewell Mount Zion Baptist Church said the church was organized by Rev. J.A. Price in 1898 and rebuilt in 1957. Many of Dextra’s people were buried in Ward Cemetery about a half-mile away. We found out the hard way there is an easier way to reach Dextra. It stands south of Sacul at the intersection of FM 1648 and County Road 898. And you don’t have to traverse muddy dirt roads.